It is possible to argue that Errol Shaw, Sr. might be alive today if Detroit's Emergency Medical Services (EMS) system were as efficient as EMS systems in other American cities. The general reports surrounding Mr. Shaw's death following his fatal encounter with Detroit police indicate that EMS response was severely deficient. According to news reports and admissions from city fire officials, an EMS unit did not arrive until 28 minutes after the first 911 calls for help. When an EMS vehicle did arrive, smoke was rolling from under its hood. There is solid evidence to support the argument that what happened to Mr. Shaw after being shot by police would not have happened in a similar event in Chicago, Los Angeles, San Diego, or several other large American cities. These cities, and a number of other large cities in America as well, have much faster EMS response times than seems to be the case in Detroit. Chicago, with a population of 2.8 million, reports EMS response times average 4 to 6 minutes. Los Angeles, now the second largest city in America with a population of 3.8 million, reports EMS response times average 5 to 8 minutes. Yet, unlike Detroit, these cities have completely restructured their EMS systems to make use of private EMS providers working in concert with traditional public fire departments to assure maximum efficiency. There can be do doubt that this restructuring has not only contributed to more rapid EMS response, but to lower per-capita EMS costs as well. In response to the charge that Detroit's EMS system is in a state of disrepair, Charles E. Wilson, executive fire commissioner of Detroit's Fire Department — within which all EMS activities are placed — stated that of the EMS system's 41 vehicles, only 12 were out of service for repair and maintenance and the remaining 29 "revealed no major disrepair or other problems" that would endanger technicians or patients. But Wilson's response was at variance with official Detroit Fire Department records. Official records show 44 total EMS units with 13 vehicles out of service and 14 in service with problems such as bad brakes; no air-conditioning (considered vital when patients are suffering heart failure), out-of-alignment wheels, and inoperative communication computers (essential to getting reports to and from trauma centers). The reported cost of providing EMS services, based on official city budget data, is $21.2 million in positions alone. With a reported 69,600 medical runs in 1999, this comes to $300 per run. However, these data understate the real cost of operating Detroit's EMS system because, unlike a for-profit entity, governments do not include fringe benefits (including retirement costs), capital costs, or maintenance costs when reporting the costs of running a particular department. If, as is generally the case in the private sector, complete labor costs are 35 percent greater than simple wage and salary reports, true personnel costs in the EMS division are closer to $28.6 million. Assuming that capital costs (maintenance and depreciation) are, conservatively, $1.4 million per year yields a full cost of $30 million. With reported medical runs of 69,600 in 1999, the true cost per run is closer to $431. Detroit has not performed well in collecting for the EMS services it renders. It is averaging a 27 percent collection rate on its EMS billings. With overall operations costs expressed very conservatively at the $21.2 million personnel cost figure (this excluded maintenance, fuel, medical supplies for each unit, depreciation on units, and employee fringe benefits, $300 per-run cost, and a collection rate of only 27 percent), Detroit's taxpayer subsidy of the city's EMS system places the city near the top of the inefficiency scale at $15.71 per-capita. Privatization is one way Detroit could overcome the problems with its EMS system. One of the first issues a city should address when considering whether to wholly or partially privatize a service currently being provided by government is to ask the following question: "Is this a service now being produced by private firms for private customers or by private firms on contract to a public entity?" The 1993 Journal of Emergency Medical Services's annual survey of EMS providers in America's 200 largest cities (also known as "The Almanac") suggests the answer is yes. The survey identified six EMS provider types: fire department; hospital-based; private; public utility model (wherein a regulated monopoly ambulance system contracts with a private provider); and a non-police-or-fire department municipal service funded and operated by a city or county government. In this mix of six possible models, four involve significant or total provision of the EMS service by a private provider and accounted for almost two-thirds of total EMS service provision. The Almanac reports on how EMS services are provided using either private providers alone or private providers in partnership with public agencies in America's 200 largest cities included a number of Michigan cities. Grand Rapids, the most populated of the Michigan cities listed relies on private providers. Flint used private providers working in concert with the public fire department. Other Michigan cities were Sterling Heights and Ann Arbor. More recently, smaller cities, such as Traverse City, Kalamazoo, Grand Ledge, Portage, and Jackson, as well as Wexford County, have moved to full private provision. Cost savings have been reported as high as 50 percent. Saving 25 percent from Detroit's EMS bill would knock $5.3 million annually from the cost of providing this service. There is significant room for improvement in the way Detroit provides EMS services. The appropriate redesign of the system should be one that follows the successful path taken by a significant number of other American cities in bringing the expertise and economic efficiency of private providers into the overall operations of emergency medical services. Clearly, the health and well being of many citizens depend upon how well an EMS system operates. 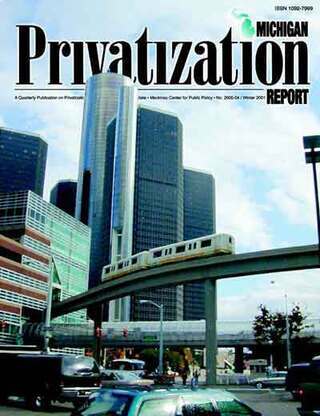 Privatization not only can help Detroit save dollars, but even more importantly, it can help the city save more lives. Charles Van Eaton, Ph.D, is professor of economics and public policy at Pepperdine University in Malibu, California.